The idea for the Evil Sim Diaries or rather, the Diary of an Evil Sim, came about just before Sims 3 was released for the PC back in June. Looking around for a serial project to write about, a game based diary of some sort naturally popped into my head since it is a style that I enjoy, as seen on The Septic Circle. Sims 3 with its free choice of who you are and what you do (to a point) was highly appealing and the landscape of opportunity for a fun and entertaining diary was vast. 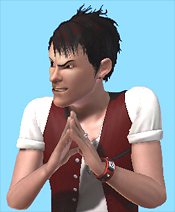 Bad and flawed people, especially exaggerate ones are much more fun to write than good folk and with the new personality trait system being a key feature of Sims 3, creating a bad Sim and inflicting him upon the world was too much of a lure to resist. Thus Devon Kacey in his evil glory was born and was quickly followed by his partner in crime, Renna. The diaries largely focus on Devon, his viewpoint, actions, and reactions to everything as he tries to dominate the world in his own way. At a later point, should time permit (a laughable notion at best), I may explore Renna’s thoughts and actions in diary form to compliment and accompany Devon’s…a fun prospect, even if only in a small sideswipe paragraph or ‘afterthought’…time will tell. The Evil Sim Diaries appear on a semi-regular basis and veer from the mundane to slightly less everyday things. Ultimately though, for anyone expecting anything thrilling or groundbreaking, this is the Sims, not Gears of War, and there is only so much you can generate in the way of action or excitement. While I have taken the angle of chronicling the life of an evil Sim and trying through my writing to make the character and his life as entertaining as possible, it won’t be to everyone’s interest, despite Devon and Renna’s best twisted efforts. So if you are curious or bored enough and perhaps missed the big button to your right, click and jump into their world. Obviously, the entries are listed with most recent first, so if you want to read from the start, you’ll have to backtrack.